Two bald eagles get entangled in the Susquehanna River after a suspected territorial battle. The Philadelphia Eagles may have won the Super Bowl, but that doesn't mean all is peaceful out in the wild. In a stunning story out of Bloomsburg, wildlife officials with the Pennsylvania Game Commission successfully helped rescue a pair of bald eagles who appeared to have each other locked into a submission hold along the banks of the Susquehanna River. 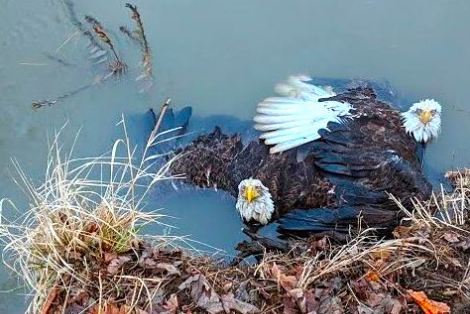 The Game Commission posted a photo of the eagles and a fascinating description of their rescue on Wednesday morning. Officials said the eagles were probably stuck together in frigid water for more than two hours before they were found. They may have remained there in part because their muscles had become frozen. To free the birds, Deiterich and Scott Township police used a pair of snare poles to lift the eagles to land, where they were dried off and transported — still locked together — to the local fire department. It took about an hour for the birds to release their talons, mercifully revealing that they had only gripped each other's feathers and skin without damaging any muscles. Wildlife officials are reminding Pennsylvanians that if they see a wild animal in distress, they should contact their regional Game Commission office.